You guessed it, more Vegan snacks! I can’t get enough of finding healthy vegan snacks recently. It is important when eating a vegan diet that you make sure you are having enough nutrients and vitamins We often take for granted how good nuts and seeds are for your body. Munchy seeds have a great range of snack packs and pots so you ensure you have something healthy to snack on or add to a meal. 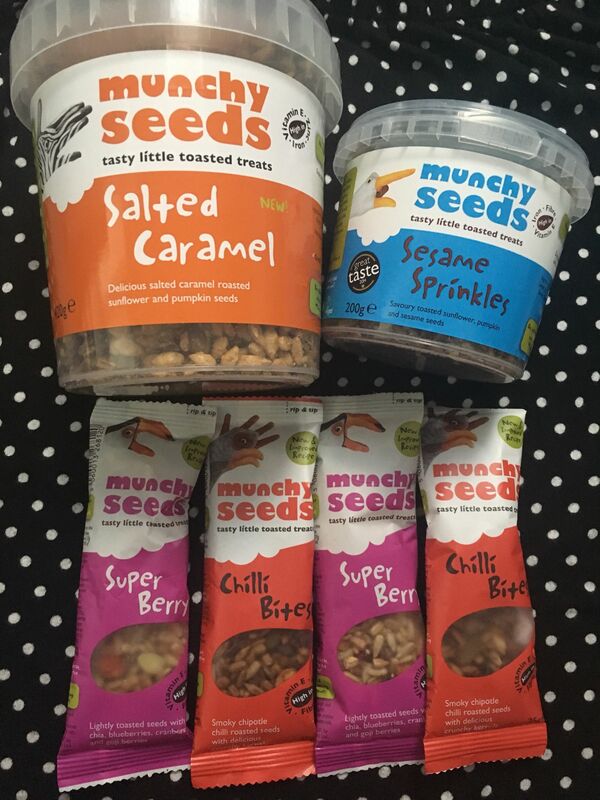 Munchy seeds have a great variety, both vegan and non vegan. Not going to lie, the chocolate ones do sounds good! The ones I have been trying are: Salted caramel, Sesame sprinkles, Super berry and Chilli bites. You can buy them in different pack sizes depending on what you want. The snack packs are so handy to carry around with you but if you are going to snack on them regularly at home or at work then it is worth getting a tub. You can eat them straight from the tub or add to a meal.I like to put a seed selection on my porridge in the mornings so something like this is ideal as I can use the supper berry ones in plain porridge to give it added flavour and nutrition. My favourite ones to snack on straight from the pot are the salted caramel ones. They are so tasty, you wouldn’t even think of that flavour when you think of seeds but it goes so well. They are great to add to plain yogurt too. Seeds are great for you as they are naturally gluten free too. A lot of people suffer with gluten intolerances and have to be so careful with what they eat. My grandad has to eat gluten free so i am always trying to find new things to share with him as well as progress in my vegan journey. Do you like eating seeds? I absolutely love munchy seeds! They’re perfect for on the go! Not too sure about eating seeds. Ooh I’ve not heard of them, they sound so yummy. These sound so good. I like trying to find more vegan items for snacks.